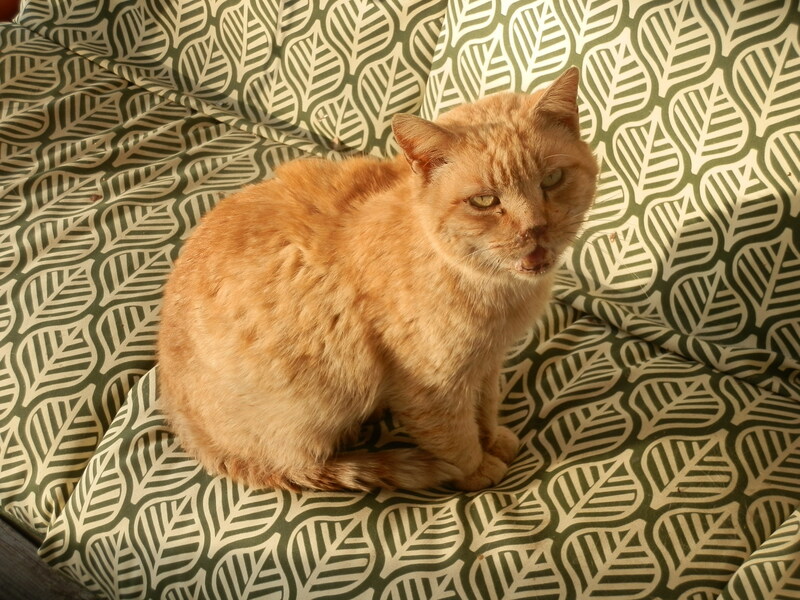 I have an old yellow tabby cat. I never had him neutered until he was about five-years-old. In the meantime he was king of the neighborhood and spread his genes around. About a month ago he turned ten. Despite his being a rambler and a total outside cat, I’d never seen a more gentle and tolerant feline. He loved attention but was never annoyingly affectionate. Chester ran to meet me every day if he was home. He never did get that rambling behavior out of his system, despite his surgery. I never bothered taking him to the vet since any type of captivity upset him. He ran away after his neuter and I never saw him for a couple weeks. My daughter used him as a prop to film Daniel in the Lion’s Den for a school project. His face strongly resembled a lion. The experience of being stuffed in a crate was too much for him. He ran off and we had a time getting him back. Even in frigid weather he prefers to stay outside and sits by the door if I pick him up and bring him in. Forget his entering on his own four feet. For the last few years he’s suffered from respiratory problems, but other than that his life has been fraught with freedom. He hasn’t wandered far in recent years and normally lays on the front porch soaking up sun. Sometimes he hangs around on my neighbor’s porch and she has become as attached to him as anyone in our family. Last Thursday I headed outside to grab the paper, and what I saw horrified me. A big yellow tabby cat with a distinctive tail showing striking contrast between burnt yellow and white, lay mutilated on the roadside in front of my house. I was several feet away and his face was unrecognizable but the tail was unmistakable. It was Chester. I’d lost him. I picked him up, wrapped him in a black garbage bag and laid him under the porch. I didn’t have time to bury him then. The whole day I thought about what a great cat’s life he had. That evening after dark I grabbed a shovel and dug a deep hole at the garden’s edge. I didn’t want any varmints to get him. I removed him from the bag and placed him in the bottom, stroking and talking to him the whole time. After finishing the job and returning to the house I knew I had to call the kids. They’d want to know. Two mornings later Roberta headed to the front porch to get Saturday’s paper. Seconds later she yelled at me to come. When I got there I opened the door and looked down to my right. Stretched out comfortably in a padded double rocking chair was Chester. He looked up, thumped his tail and let out a faint meow. I’d buried the wrong cat! I never did scrutinize the whole carcass. It was pretty gruesome. I assume the cat must have been one of Chester’s many offspring and one of numerous feral cats roaming my neighborhood. However, if anyone in Winfall lost a yellow tabby cat recently, he received a good Christian burial. This entry was posted in Uncategorized and tagged neutered, outside cat, tabby cat, yellow tabby cat. Bookmark the permalink. Just found your BLOG!!! How wonderful.